Bridge Designer is an easy-to-use bridge design simulation software that enables users to be highly productive. The application has a wide array of tools that can be employed to ensure that bridge designs are compact and can last long before agencies spend money on building them. With Bridge Designer, engineering teams have access to a platform that lets them define parameters and Service Code specifications when testing the integrity of their design. This lets them make sure that their bridges are strong in every aspect. Moreover, Bridge Designer performs at the maximum capability to provide accurate simulation results. Plus, it can also generate models swiftly without overtaxing computing resources. Bridge Designer is a revolutionary application, not only because it has extensive state-of-the-art bridge designing tools, but also because of its user-friendly interface. It is built to comprehensively analyze bridge structure whether they are still under construction or already being used heavily. That is why it puts tools within easy reach of users so they can swiftly and intelligently analyze their bridge designs. Bridge Designer features a host of innovative tools that enable users to analyze every aspect of bridge design. These set of tools arms them with the means to make informed decisions in modifying their designs while still adhering to construction codes and company regulations. Although Bridge Designer is a powerful application, it is able to deliver fast analysis results because of its enhanced solution engine. It optimizes the software’s performance while making sure the system is not overtaxed. Bridge Designer is created to be compliant with internationally-set and acknowledged standards. For one, it has the FIB Concrete Code for Bridges as a default code. Other than that, it has American, British, and Indian building codes. This lets bridge designers make sure that their designs adhere to regulations so they do not encounter issues at a later time. Bridge Designer provides simulation and analysis results in easy to understand and ingest graphics. These let people swiftly understand the impacts of their design in detail without having to go through a long report. 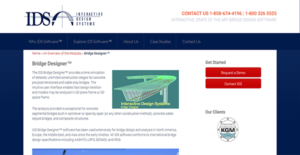 If you are considering Bridge Designer it could also be a good idea to examine other subcategories of Best CAD Software gathered in our database of B2B software reviews. It is crucial to realize that virtually no software in the CAD Software category is an ideal solution that can meet all the needs of various company types, sizes and industries. It may be a good idea to read a few Bridge Designer reviews first as specific services may excel exclusively in a very small group of applications or be designed with a really specific industry in mind. Others can operate with an intention of being easy and intuitive and as a result lack complicated functionalities desired by more experienced users. You can also find apps that focus on a wide group of users and provide a powerful feature set, however this in most cases comes at a more expensive cost of such a solution. Be certain that you're aware of your requirements so that you choose a service that provides specifically the features you look for. How Much Does Bridge Designer Cost? Bridge Designer is an innovative software suite geared towards helping engineers build bridges with strong structural integrity. Teams and agencies interested in the solution can request for their enterprise pricing information from the IDS sales team by phone or web form. We realize that when you make a decision to buy CAD Software it’s important not only to see how experts evaluate it in their reviews, but also to find out if the real people and companies that buy it are actually satisfied with the product. That’s why we’ve created our behavior-based Customer Satisfaction Algorithm™ that gathers customer reviews, comments and Bridge Designer reviews across a wide range of social media sites. The data is then presented in an easy to digest form showing how many people had positive and negative experience with Bridge Designer. With that information at hand you should be equipped to make an informed buying decision that you won’t regret. What are Bridge Designer pricing details? What integrations are available for Bridge Designer? If you need more information about Bridge Designer or you simply have a question let us know what you need and we’ll forward your request directly to the vendor.